As a Virgin Media customer that has tried multiple providers, I decided to write a virgin media review based on my experience as a Virgin customer and the benefits of such. The main reason I decided to join Virgin Media is that they offer the fastest home broadband speed of any of the main providers. Most other providers also rely on BT which then means that there are lots of complications when it comes to problems as they are all blaming each other, something I have found to be frustrating. Especially as I work from home so rely on my internet connection to get my job done. I wanted to do a Virgin Media review so as to assist other buyers with their broadband purchase. I have worked in technology for over 20 years and spent most of my career designing networks. So I have a good understanding of how it works. Virgin Media was one of the first providers to bundle together and they offer better discounts if you buy all the services together. This is why it makes sense to go with one provider for everything, fixed and mobile telephone, television and broadband internet services. There are some amazing Virgin Media new customer deals on their website and to be honest it’s one of the main reasons I shop around. Virgin Media new customer deals are also a great way to make a savings if you also subscribe to TV, have a mobile phone and a home telephone. Broadband and home TV and telephony services are like most things, the companies that supply these services offer the best deals for new customers rather than reward existing customers. Nobody’s got time for the spinning wheel of doom or for streaming video or music to jitter. They are capable of delivering speeds of up to 300mbps, which is faster than any other home broadband provider. What enables Virgin to be at the cutting edge is they aren’t reliant on copper cable that has spent decades in the ground. Even the likes of BT and Sky who have invested heavily in upgrading their network to high-speed fibre, they can only deliver fibre to the green box at the end of the street, from the green box to your home, it still relies on that ancient copper cable from the green box to your home. In my experience of using them, I signed up for multiple Virgin Media services to save money. They did actually mess up my order but they quickly resolved it with the customer service team. I was also able to change my install date quickly because the original date I had didn’t suit. New customers also get a 14-day money back guarantee if they are not satisfied with the services provided. So you can cancel for any reason. When my order was placed, I received text messages to keep me informed of my order progress and what happens next. Virgin Media provided an engineer to install a Super Hub at my house and he tested that the connection was fully operational before leaving. I was asked to confirm I was satisfied with the installation. If you prefer their self-installation service they make it super simple; you get a full kit and simple instructions. As I was taking a phone line, TV & Broadband service I didn’t use the self-installation service. They don’t offer self-install if you decide to take their TV service. Bundles are what it’s all about these days due to the savings you get to have everything under one roof. Here is a brief overview of what you get. 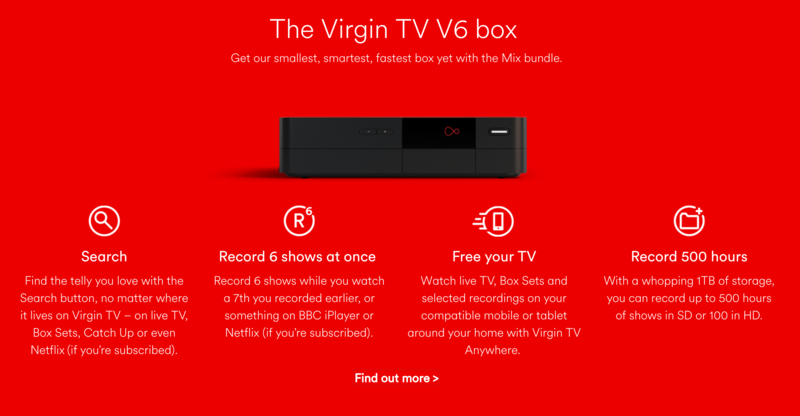 One of the fantastic new customer deals available at Virgin Media is the Player Bundle. With this deal, you get quality services such as a home phone, TV, and broadband. Player TV – this consists of all the free to air channels including HD plus catch up services like BBC iPlayer, ITV Hub, Channel4, YouTube and Vevo (Music Streaming). You can also purchase movies from as little as £3.99 per movie. Virgin media offers an activation fee service of £20.00 at the time of writing but sometimes they waive the fee, check their website to see if the offer is available. You get to enjoy all these services at £32 a month for one year. The next package up is the MixTV Bundle, it offers more of the same core services as the Player Bundle but includes more TV Channels and the Virgin V6 Box. Mix TV Bundle – this consists of all the free to air channels including HD plus catch up services like BBC iPlayer, ITV Hub, Channel4, YouTube and Vevo (Music Streaming). You can also purchase movies from as little as £3.99 per movie. There are 34 Channels available with this package including some premium sky channels. Like Sky1, Sky2, Sky Living, Comedy Central, MTV plus more.A full list is available on their website. The next package up is the Mix TV Bundle, it offers more of the same core services as the Player Bundle but includes more TV Channels and the Virgin V6 Box. The next package up is the Full House TV Bundle, it offers more of the same core services as the Mix TV Bundle but includes more TV Channels. Full House TV Bundle – this consists of all the same channels as the Mix TV Bundle but there are extra channels giving you 58 in total. These include BT Sports channel, documentaries and some kids channels like Nickelodeon. It also includes Sky On Demand so you can catch up on any of the Sky TV shows you may have missed.A full list is available on their website. Depending on your preference, you can get Virgin media broadband speeds of up to 300mbps of fast internet connectivity. In addition to that, you get unlimited downloads, parental safety feature and free talk time during weekends. What is amazing with Virgin Media new customer deals is that you usually make a big saving over existing customers. During your first 12 months as a new customer, you get to pay much less as compared to the older clients. With an activation fee of 20 pounds, you get the above services at 32 pounds per month. If you are planning to move your services to a new house, virgin media is the simple choice as the charges are free. Having moved house numerous time (about once a year for the last 5 years) I know there are so many things to worry about. There is nothing worse than getting settled in your new home and having no wifi. However, when moving with Virgin they pretty much handled everything. All the Virgin Media reviews do say that providing maximum notice does result in ensuring on time installation ready for your move. The sooner you tell them that you are moving they can make sure they are on hand to assist you. They ask you for information concerning your moving dates, the new address of your home and account number. A very friendly engineer comes and installs the broadband services at no charge and they keep you up to date via text. It includes delivery of all equipment. They do not charge for network repairs or restoring services in the event of outages or equipment failures when the fault is on their side. Moving house can be a stressful experience, especially when you need to move your TV, Broadband, and phone services. As such, you need to get a reliable service provider to move your services so that you will feel as comfortable as possible when you have finally settled at your new residence. I strongly recommend getting a recognised company to move your services when moving house. That said, using Virgin Media moving house were brilliant whereas BT and Sky, despite being recognised names- having tried them before were not so great and I was left without internet for a few weeks both times. Given that the service provider will have the best crew in place to move your services, you can be sure of saving some money. This is because the movement process will be very slick, which means that you won’t risk creating any damage that may require cash for repairs. There are also great Virgin Media offers to be had for different packages. Given that Virgin Media is a service provision company that has been in business for a long period, you can expect that you will be served in the best manner since their customer service is excellent. The only thing you need to do is to notify the customer care of your moving early enough so that they will set up the best crew and services to give you a smooth transfer of services. The last thing that you want to hear is that you have to wait for an unknown amount of time to have your services up and running once more. With Virgin Media deals, you can expect that you will be online once again as soon as possible, especially if you had notified the company in time. Mostly, the wait up time will depend on the location of your new residence, but be sure to have your services set up as fast as possible so that you don’t feel inconvenienced. After you move to your new house, you will expect the services to resume as fast as possible, which means that the activation of your services needs to be fast and easy. That is exactly what you receive from Virgin Media deals, as they understand that you need your services as soon as possible. I found activation to be a seamless transition as indicated by Virgin Media reviews I read before ordering online. After moving to your new address, you can have your services improved so that you will receive the maximum benefits from your Virgin Media package packages. The only thing you might need to do is consult them with more information about your new address so that they can know how best they can improve your services. Virgin Media offers can provide super fast broadband services on their own or packages including tv and phone too. When moving to your new house, you will have to provide the company with a 14 days’ notice, whereby you are liable to pay for your services as usual during that period. However, if your services have not been moved within those 14 days, you will be refunded for each extra day you go without services. Looking at the benefits above, Virgin Media packages should be your ultimate solution when it comes to moving the services in your home to another location. Be sure to contact their customer service before the important day of your moving, so that arrangements can be made to give you a hassle-free movement. Of all Virgin Media reviews, 90% reported the transition of Virgin media moving house was the smoothest transition of all broadband suppliers. Virgin Media is the king of broadband in the UK. Aside from being the fastest broadband service provider, it is also the most reliable. Virgin Media has won several awards over the past few years. For example, it got the uSwitch award for Best Broadband, TV and Home Phone 2017, Best Retailer Customer Service 207 and fastest Broadband service provider 2017. In 2016 it won in Broadband Genie’s Best Broadband Provider and Fastest Broadband Provider. Virgin Media offers broadband speeds based on DOCSIS 3 cable technology which has a thick copper core, thicker than the cables that other companies offer. In addition, the insulation is made from quality material. These two factors make Virgin Media broadband speeds faster and more reliable. If the package you signed up for promises you 100 Mbps, then you will be more likely to get 100Mbps download speeds with Virgin Media packages than with any other broadband service provider. Virgin Media owns all their networks and does not use any third parties. This means that they can measure and keep track of speeds for their consumers, making their ability to maintain high speeds better. This is yet another reason why Virgin Media wins. Based on the company’s own analysis and statistics, their network has been reliable 99.9% of the time since April 17. Even though in advertising and on their website they say that speeds are ‘up to’ what is promised, chances are that on low traffic or over a 24-hour period, virgin media broadband speeds will be even higher than what was promised. On their website, Virgin Media looks at an example of actual speeds experienced by their customers in April 2017. The peak period is between 8-10PM. Taking a specific example of the Vivid 100 offering, average speed during peak period was 95.54Mbps. The speed for Vivid 200, Vivid 200 Gamer and Vivid 300 was 167.6, 184.91 and 301.21 Mbps. These are pretty good speeds for peak period. The Virgin media reviews indicate a strong product combined with good customer service. Thumbs up. Fibre optic technology makes use of small stands of plastic or other material which are created to transfer light. Thus, you get higher speeds than through normal cables because it travels at the speed of light. Such transfer is also less likely to experience interference from external sources such as electricity. As was mentioned, the DOCSIS 3 technology used by Virgin Media goes an extra mile making their speeds twice as fast as any other broadband service provider in the UK. Do you have a problem with slow internet? Virgin Media offers the solution to your problem. In this generation, the slow internet can make you lag behind in life. Especially for people like me that work from home, slow internet is just not an option. Virgin media offers don’t only provide you with fast internet but with a variety of other deals and packages. Installation of Virgin Media cable to a first time user is easy compared to installation of other network cables. You can either choose to have the bundles or broadband packages or even both at an affordable price. What are some of the Virgin Media packages available? Virgin Media offers all services you could ever want from a phone. The services are of high quality and very reliable to you as the user. You can subscribe to the most suitable call plan from the ones available. You can opt to choose the unlimited extra talk, international talk, the evening talk or weekend talk plan among other options. Plus, if you did opt for a ‘dual’ bundle you get weekend talks as a bonus. Subscribers of triple play bundle also get a talk anytime gift. It’s a form of cable network from the virgin media organisation. It uses fibre optics which makes it so much different from their competitors who use BT network. The network allows you to browse and download at a fast speed of 200 Megabits per second. With this kind of speed, you won’t have to wait for a download; it’s more of a click to open initiative. Virgin Media offers UK home owners with other deals such as Wi-Fi and smart call application. Clients can connect to a free Wi-Fi but only in the areas where they have their networks. The application enables smartphone users to make affordable calls. Virgin media reviews highly rate this feature. You might not be familiar to this but, Virgin Media broadband speeds are the fastest download speeds in the entire of the United Kingdom. If you install this kind of network in your home, you will say goodbye to slow the internet. Virgin Media new customer deals provide great packages at great prices. Regular internet users are aware of how frustrating poor internet can be. Especially when you are streaming a video, and you have to play it back frequently. The other advantage is that it does not use BT network, rather they have their own wholly owned network which makes it’s completely independent of third parties. Another advantage is that Virgin Media offers don’t limit you to a specific data you should download. It, therefore, brings a whole new perception towards browsing, streaming and downloading. Virgin Media reviews advocate they are a company takes extra care of their client’s problems and ensure you get total satisfaction.